Just as the weather cools this week, Oregon’s Spring Break begins. I’m taking the week off (plus a few days). No posts until at least Sunday the 30th. Kids, enjoy your time off and behave. I may occasionally post pics of my travels over to the right on Facebook or Twitter. Typically I’ve headed to a sunny place, or ski. But this time family & I are heading WAY east. Visiting some historical places and good food. It was another spectacular “June in March” day west of the Cascades. Check out those highs! The strong east wind is transporting slightly “cooler” air into the central/east metro area. Troutdale only made it to 65 yet Aurora was 79! Records were set again in Astoria, Salem, & Eugene. Tomorrow the east wind dies off the 2nd part of the day; add in full sunshine and Portland should see the warmest temperature of the week, into the lower 70s. At the same time the switch to onshore flow south of Salem and along the coastline drops temps there. Onshore flow and lots of clouds push us back down into normal territory Thursday and beyond. Enjoy one more day of sunshine and very warm temps! Today felt more like Memorial Day than one day after St. Patrick’s didn’t it? EVERYONE west of the Cascades made it into the 70s with numerous record highs set for March 18th. That’s everyone except the Portland metro area. Portland sure sticks out doesn’t it? More on that below. Most likely a few additional records were set at cooperative observing stations, but those records don’t show up until after the month is over. In the metro area, strong easterly wind kept temperatures “down” a bit. Mid-upper 60s closest to the Gorge to lower 70s farther away from that “cool” air. 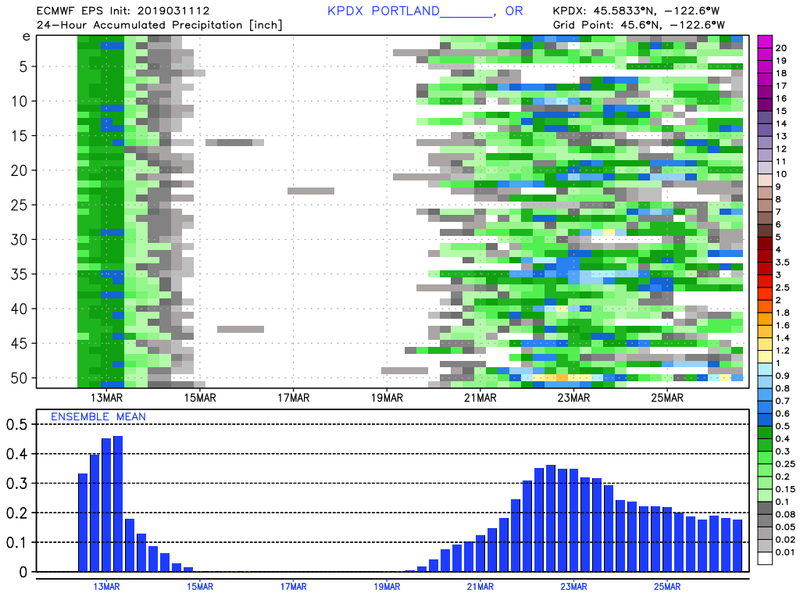 That’s why PDX is always a tough forecast in this pattern both spring and fall. Too much wind and temperatures don’t reach their full potential. What’s ahead? More of the same Tuesday. The airmass warms slightly, and highs move uphill a bit east of the Cascades too. That means we could have lots of mid 70s again tomorrow. Portland will see just as much wind tomorrow so I figure maybe 2 degrees warming at PDX. We should finally hit 70…just barely. Wednesday will likely be Portland’s warmest day as east wind dies down in the afternoon, eastern Oregon temperatures warm further, and thick cloud cover stays to the south across southern Oregon. We could get as warm as 75 Wednesday, but 73 seems like a safe call for now. Thursday we’ll see partly cloudy skies with no offshore flow = back to more typical highs around 60. It’s hard to believe. Just 11 days ago we had a snowy day with high temps in the mid 30s in Portland. Remember the day it was dumping snow all day long but hardly sticking? Or just 9 days ago some parts of the metro area had a 1-3″ dumping of snow during the evening hours. How things have changed! 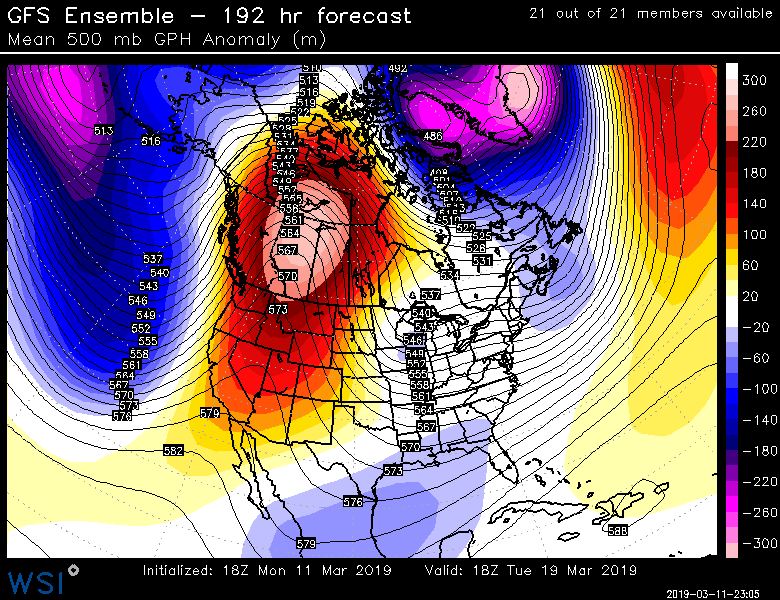 The well-advertised upper-level ridge along with a warming atmosphere is firmly in place over the Pacific Northwest. The mild offshore (easterly) wind flow plus solid sunshine pushed most areas up to around 70 degrees west of the Cascades. The last time Portland was 69 or higher for a St. Paddy’s Day was the 71 degrees in 1978. Pretty impressive! Temps made it into the 50s over the half snow-covered terrain in the Columbia Basin. Notice lots of gray beginning to show up over there. All the white is snow, not clouds. It’s taking quite awhile to melt that snow, but even warmer temps into the 60s this work week should finish the job. What’s ahead? More sunshine and an unusually strong east wind (for late March) Monday and Tuesday, then the wind backs off the 2nd half of the week. The Portland-The Dalles pressure gradient is up to 6.5 millibars this evening and will increase even more tonight. Several models push 50 mph easterly wind over the metro area just 1,500′ or so above the surface from late tonight through Tuesday. With the excellent mixing each afternoon, gusts over 40 mph are sure possible. 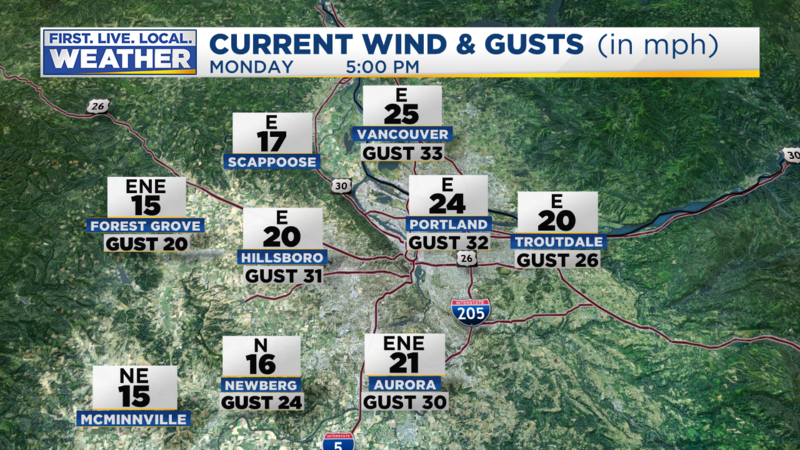 The wind will be widespread too since it’s coming right over the Cascades as well as through the Gorge. The result is a very simple forecast for the next three days. Sunny or mainly sunny skies, a breezy east wind, and highs somewhere between 65 and 75 in the metro area. Coolest temps will be around the mouth of the Gorge and warmest away from the middle of Portland. 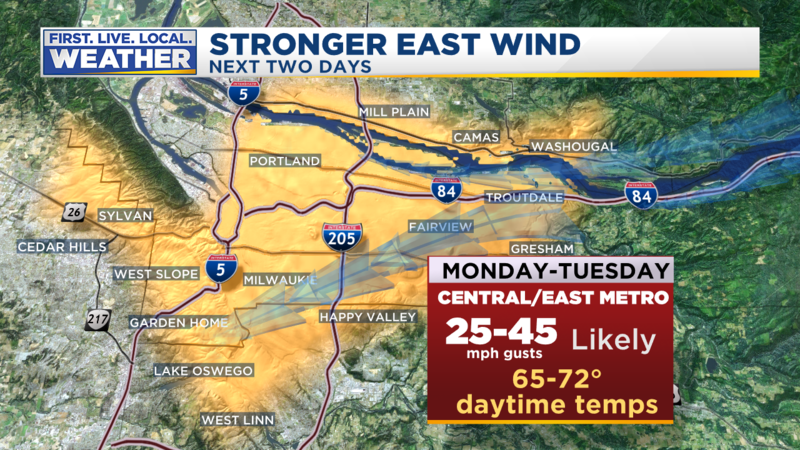 PDX is a real pain to forecast since TOO much wind could keep it below 70 the next three days. Not exactly a critical life-threatening forecast, but I like to get it right. Seems safest to just leave the forecast at 70 degrees tomorrow and Tuesday. The Oregon Coast will be in the lower 70s the next two days and so will most Willamette Valley locations along with Longview/Kelso. 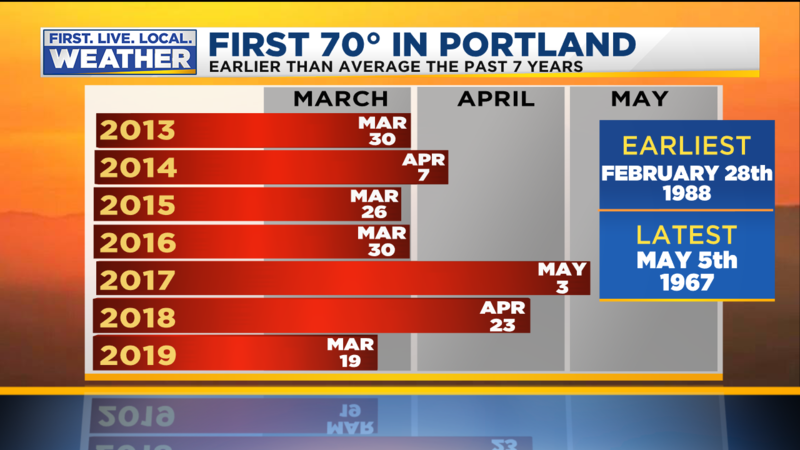 By the way, record highs are 71, 73, 71 the next three days in Portland. So we could break a record…maybe. 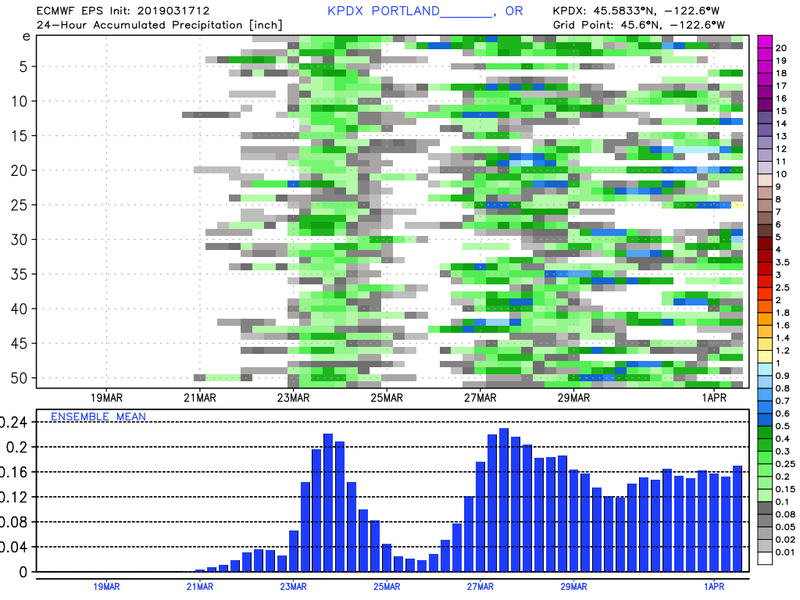 Looking farther ahead, the 24 hour precip chart from the ECMWF ensembles gives us a hint about Oregon’s Spring Break. Of course when the kids get out of school on Friday they are FREE for a week. I know lots of you travel other places, but if you’re staying here it looks pretty typical. Showers arrive Friday evening and stick around Saturday. But you can see a drier period about next Sunday/Monday. Maybe a hint of something a bit drier 4-6 days after that. But of course that’s pretty far out. Temperatures look close to normal as well for the next 15 days. You can add 3-5 degrees to many of these days, the 2 meter temp tends to run a bit cool on this Euro product. To wrap it up, the bright sunshine is great, but we’ll see strong wind the next two days. But there’s no sign of stormy weather as we head towards the end of March. And there’s definitely no sign of unusually cold weather either. Well, it’s time…time to “Fork Winter”. 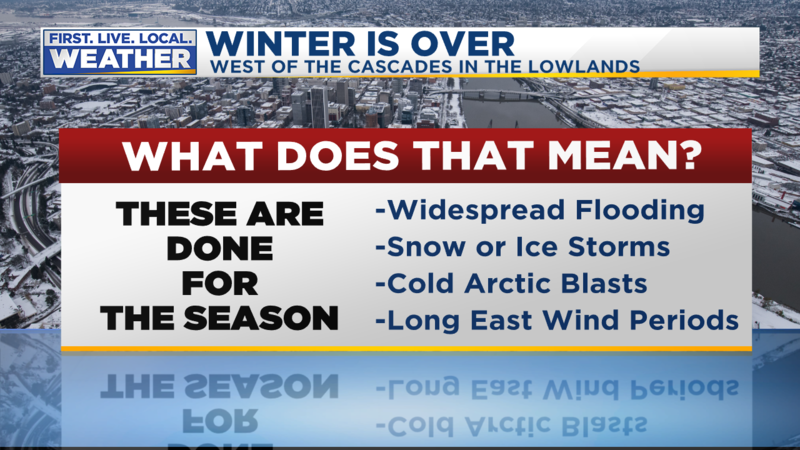 Winter is cooked & finished west of the Cascades. Put a fork in it! Wayne requested I formally admit Winter 2019 is over during the 10pm newscast. I assumed it was obvious this time around. It’s so late in the season and we have 60s coming up later this week. By the way, thanks again to John Rinier for that nice huge wooden fork! What does “winter is over” mean in our climate? What could we still see? Now that first one is VERY unlikely, especially considering I don’t see any cold airmasses approaching in the next 10 days. Typically I’ve put the fork in winter during late February, and of course it’s relatively easy to get a brief wet AM snowfall in early March. Far less likely in late March. Of course we can still get a frost the 2nd half of March, but we’re done with those low-mid 20s for the season. Remember we’ve seen some strong wind in April recently. Peak gust of 56 mph in early April 2017 during a rare late-season windstorm. So yes…it’s time to get your snow tires off, uncover your faucets, and open up your crawl space. Spring is on the way! but snow-covered terrain holding down temps for most of you east of the mountains. Somehow a southerly wind pushed Central Oregon into the 50s…the melt is on! What’s ahead? The big picture shows that we are in a 10 day period with temps mainly above average. It also appears drier than average. Expect a rainy night and then showers & sunbreaks Tuesday through early Wednesday morning. We might even see some hail or a rumble of thunder. But this appears to be the only rain between now and the middle of next week. Take a look at the ECMWF model ensemble chart for 24 hour rainfall. 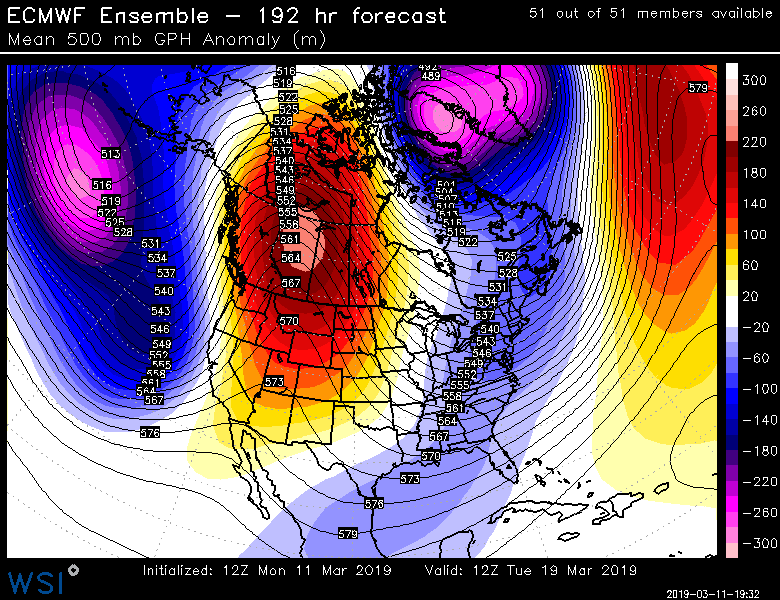 and then still there Tuesday on both the ECMWF & GFS. Click for a larger view. Could we hit 70 degrees? Yes. 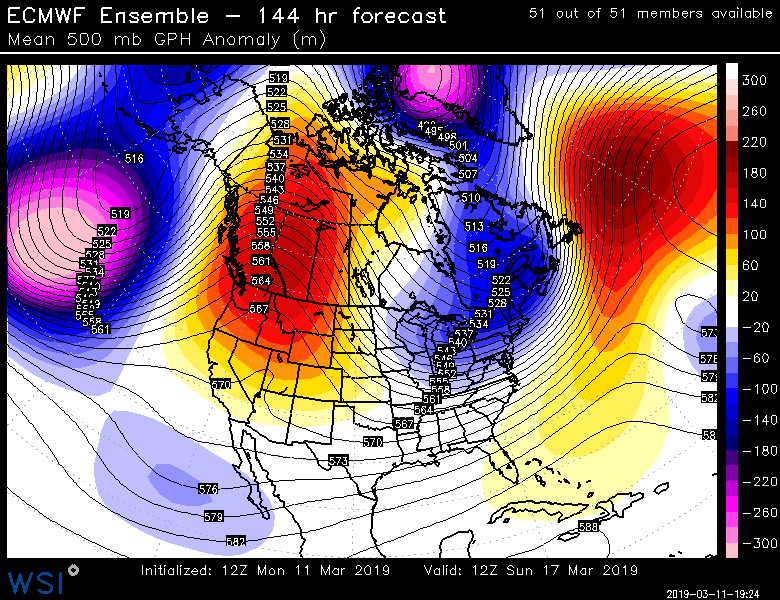 850mb temps rise to +4 to +7 on both GFS/ECMWF Friday through Sunday. We have light offshore flow (easterly wind) through the period. That combo with sunshine is enough to push us into the 60s. Under sunny skies Friday should be our first 60 degree day in Portland. A weak system may send a lot of clouds overhead Saturday so I kept our 7 day forecast numbers in the lower 60s for Saturday too. According to my “magic” chart, 850mb temps of +7 should get us to 66-69 Sunday (with offshore flow and sunshine). 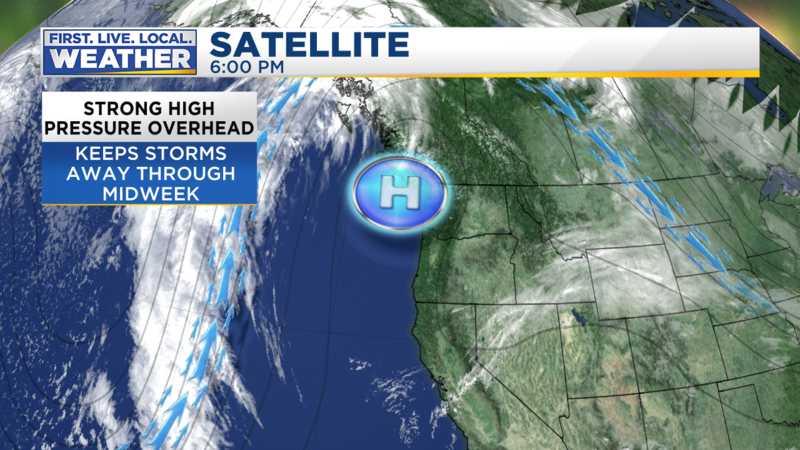 As the ridge reaches maximum strength and moves overhead/east Monday, we continue with offshore flow and sunshine. Models push us to around +10 that day. In the past, this setup has given PDX a high of 70-75 degrees in mid-late March. So 70 is likely a good call for Monday; our first 70 of the season. If models still look the same tomorrow I’ll go for it. 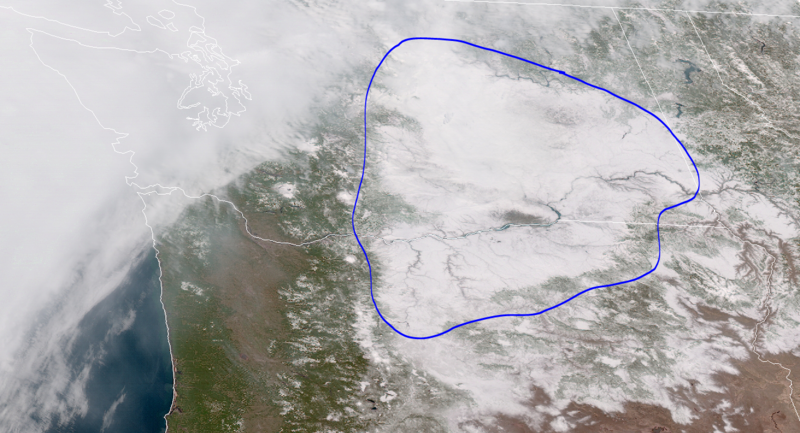 Of course one issue is the snow cover east of the Cascades. I only see a small area snow-free in the Columbia Basin right now, but strong westerly flow and highs in the 40s the next two days should melt out many of the lower elevations eastside. I expect it should be at least half snow-free by Friday. 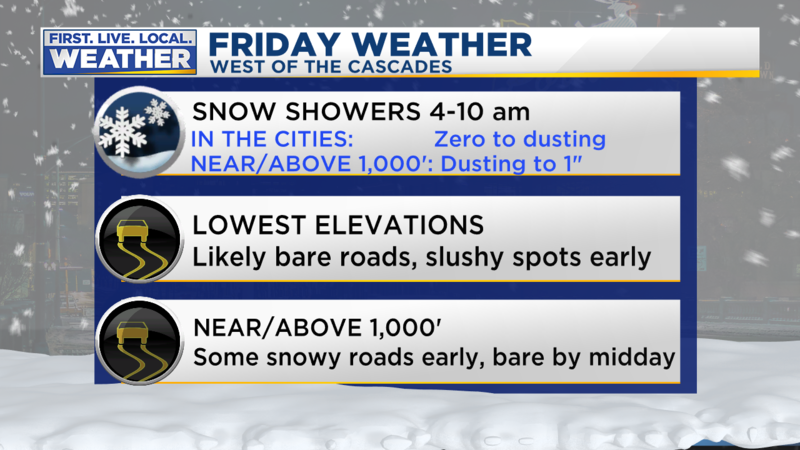 So I think it’s unlikely snow-cover east of the Cascades will have an effect on our temps this weekend and beyond. Today was nice with partly cloudy skies and occasional rain/snow/hail/graupel showers wasn’t it? Seemed a bit more like typical March weather. Cold showers continue to stream onshore this afternoon. I expect that setup to continue the next 24 hours. That means once again late tonight temperatures cool enough to drop the sticking snow level down below 1,000′. That said, most models aren’t showing significant shower activity. That, plus 850mb temps (temp in Celsius around 4,000′) only drop to -7, pretty marginal for lowland snow in March. Note that 4 different models produce very little snow for us. Plus I’ve noticed this several times recently; models tend to produce too much snow with these “onshore flow/snow shower” setups. Even the WRF-GFS tends to produce too much snowfall in this pattern. It looks like this through tomorrow afternoon. 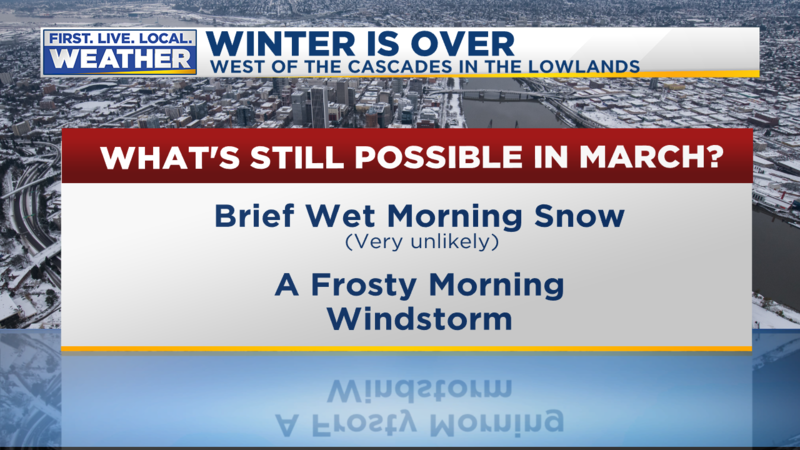 Mainly bare areas in the lowlands, maybe best chance for a morning slushy dusting far west metro; and in West Hills plus Chehalem Mtn. And to top it off, I had my snow tires taken off today. Sooo much quieter without those on the freeway! Looks like a 2nd mainly sunny March weekend! Lots of leftover clouds Saturday morning, then offshore flow means mainly sunny Sunday. Temperatures will still be a bit below normal, but at least around 50 degrees. Also note some nice dry weather too. First Friday-Monday, then possibly again late next week. Each horizontal line (51 of them) represents one ensemble member’s forecast of 24 hour precipitation the next 15 days. The bottom part of the image represents the ensemble average. I love this graphic because it summarizes lots of info. For instance just with a quick glance you can see we’ve got guaranteed dry weather Saturday through Monday, then all ensembles give us rain Tuesday. 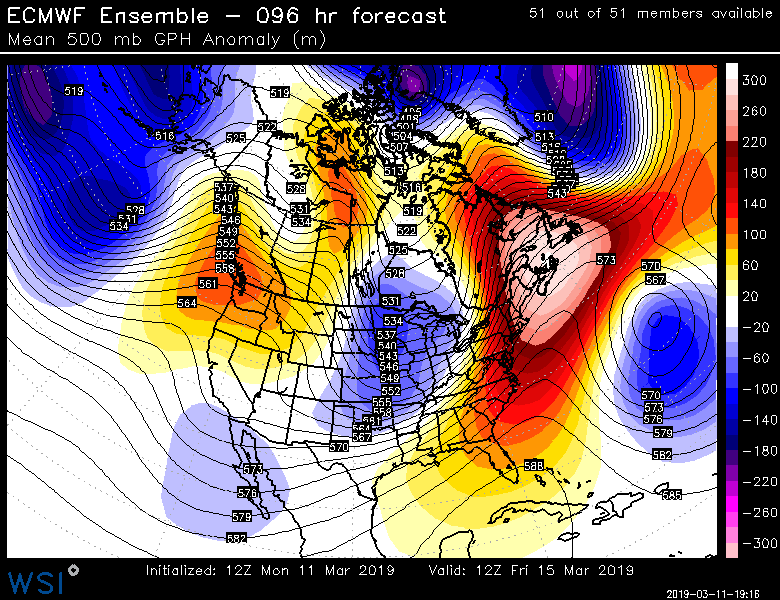 Then a very strong signal (good ensemble agreement) that we’ll have another dry or mainly dry period NEXT Thursday through NEXT weekend. 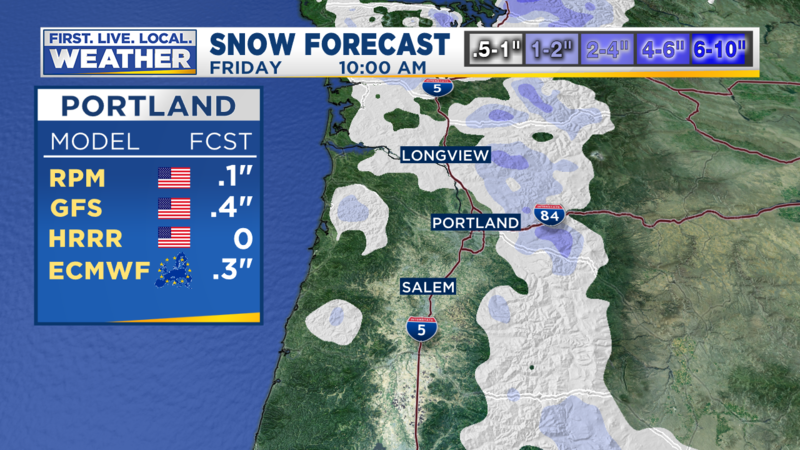 Tomorrow is the last chance for snow in the lowlands of western Oregon and Washington, most likely even in the air. Snow cover east of the Cascades below 3,000′ will begin melting slowly the next 5 days. Then later next week melting should accelerate. Lots of water going into the ground in the Columbia Basin the next 10 days!